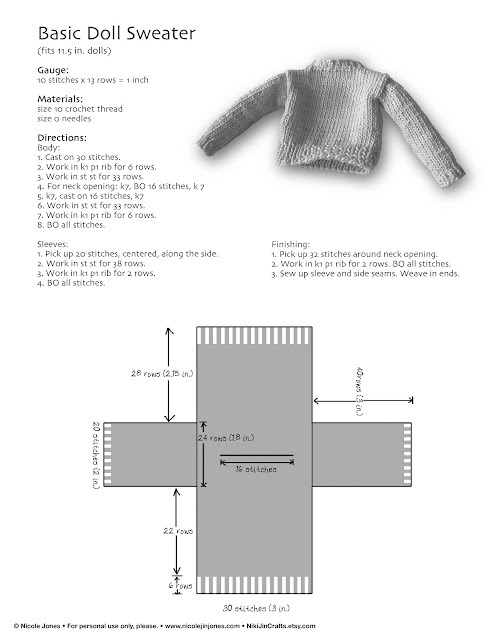 The miniature sweater knitting pattern has been revised. I would have never thought of using crochet thread!! Smart. Best of luck with your etsy shop! Thanks you for sharing your pattern too. I can't wait either. Off to the store to get supplies. :) I love dolls and their clothes. I made the sweater, although I changed it a bit. I didn't do the neck ribbing because I thought it looked good without... and I shortened the sleeves because the body ended up being short on my doll, so it is more of a "top" than a sweater. I also made the sleeves wider. I love the look of the crochet cotton!! See it on my blog!! I'm glad you are all enjoying the pattern. 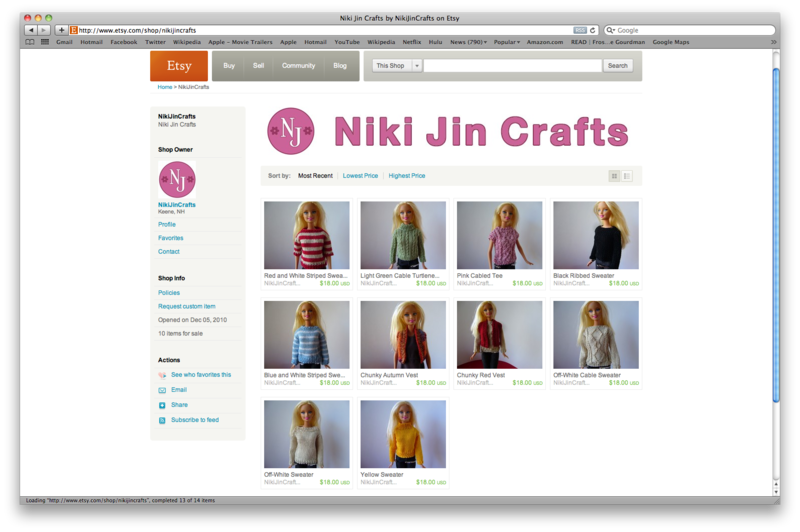 Lindy, I loved seeing the sweater on your blog. Your alterations looked great. If it's coming out too small, I might try size 1 needles instead of 0. I have used both sizes. It might also be a little short because of a couple typos in my pattern (continue reading below). I've noticed that there is a mistake in my pattern. (SO sorry!) Apparently, I have trouble adding! Steps 3 and 6 of the Body instructions should say "Work in st st for 33 rows," not 31. The front and back should each have a total of 40 rows (6 edging rib + 33 even stockinette stitch + 1 row for neck opening). The diagram is still correct. I have been searching for a sweater like this all over the web, and was thrilled when I found yours, Thank you for sharing with everyone!! Dear Niki, Thank you very much for sharing your pattern. I have made things for Barbie in the past and have a trick you might enjoy. If you hold two strand of sewing thread with your crochet thread it creates a tweed look, and a nice designers touch with out the high price of fancy yarns. In fact its a great way to use up left over spools of thread. Hope you enjoy, Best wishes Mrs. K.
Is that size 1 knitting needle a 1.0 mm, or is it American size 1?